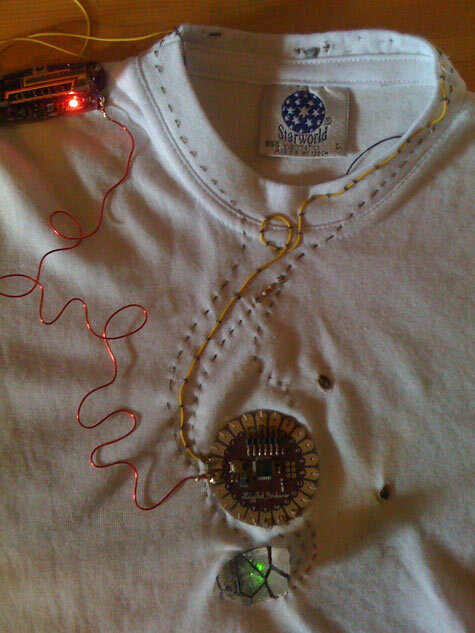 My challenge was to gain sufficient skills and understanding of electronics and programming to be able to devise and make a responsive wearable item in 2 days! 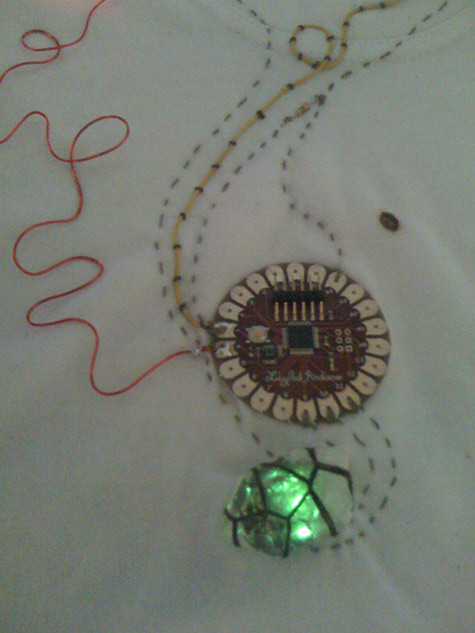 Although the intended output for this course was in clothing and textiles, my interest was to consider how this technology might be incorporated into jewellery and other wearable items. I made a heat responsive glowing rock crystal which pulsed red, blue or green depending on the temperature input measured by a thermistor on the back of the neck. if it's red you're hot! The circuit was controlled via the arduino lillypad – a multi input/output, miniature circuit board which carries a programmable chip. 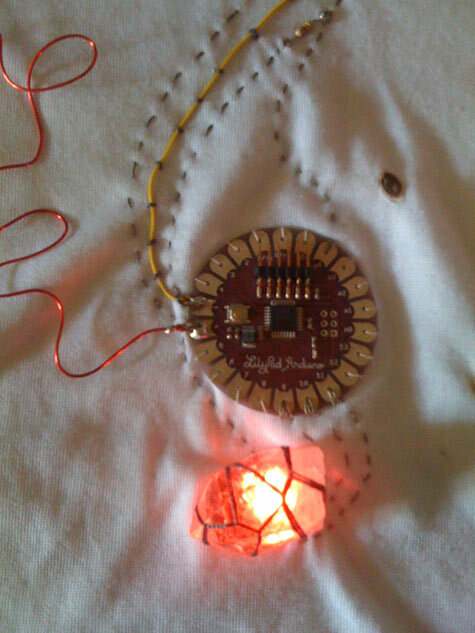 With assistance I programmed mine to collect temperature data and to output this data to a small colour changing led. The chip instructed the light to flash a specific colour depending on the data range. My plan would be to incorporate this circuit into one of my ‘Precious’ pendants, with the rock crystal contained within the silver sphere and the thermistor resting on the neck, somehow incorporated within or along the chain. I was very pleased to produce a fully functional prototype by the end of the 2 days! I was also interested to experience new approaches to teaching and learning for an adult audience, within this short-term / intensive context. My experience of electronics prior to this course was limited and distant, and my knowledge of programming even more so; although this course was advertised as accessible for beginners it was necessary to cover a lot of ground in a very short time, and not surprisingly the course content was somewhat challenging for me and several others in this group of 12. I am reminded that pitch and pace need to be monitored and modified according to the needs of the group you are working with. Further challenges were presented as there were insufficient resources for each of us to follow the basic tutorials independently; not all learning experiences can be enhanced through teamwork, or sometimes this kind of pairing -the dynamic between 2 individuals – just doesn’t work. However, I do think it’s important to present students with new and sometimes difficult circumstances, as this can give rise to new insights and understanding, in a wider, non-subject-specific context which enriches one’s experience and appreciation of life. We benefited from a great 1:4 tutor/student ratio, with tutor and assistants each having their own skillset. it was difficult to get the right help when we needed it. ..the programmer was in very high demand and it was hard to get time with him. As a tutor, how necessary it is to ensure you make yourself available to each student at least once, regardless of the numbers of assistants on hand. Also the need for all students to feel able to approach you…a teacher needs to be warm! On a personal level I also found interesting the degree of creative challenge presented when, having been introduced to the resources and processes, we had to develop our own projects.. I expect my own students to work in this way all the time, and personally I found it a stressful experience! I was as much relieved as I was pleased to hit upon the idea of the input/output; talking with my peers helped to further hone the initial idea and I was grateful for their input. Valuable assistance can be provided via other students – importance of fostering an environment where personal knowledge and experience can be shared..
We were given links to several very useful online resources should we want to continue to develop our projects and it was refreshing not to be overloaded with photocopies… sadly the main student support site at www.tinker.it was disengaged soon after completing the course – a frustrating, inherent problem with the internet. This course gave me the opportunity to play with emerging technologies, and it gifted me a short moment to think outside of my usual materials’ parameters. I enjoyed swapping places from teacher to student, and my own students have benefited from these insights gained and technologies explored.